Accepted Scientific Name: Orbea variegata (L.) Haw. Syn. Pl. Succ. 40 40 1812. 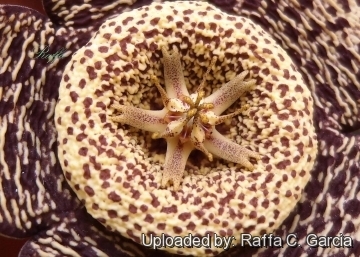 Orbea marmorata (Jacq.) Schult. in Roem. & Schult. Orbea normalis (Jacq.) Schult. in Roem. & Schult. 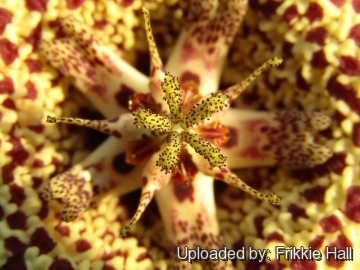 Stapelia retusa (Haw.) Schult. in Roem. & Schult. 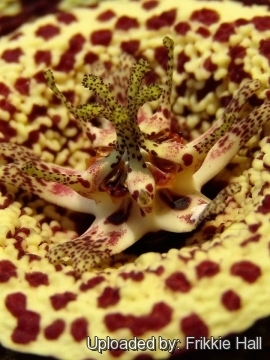 Stapelia variegata var. brevicornis N.E.Br. Stapelia variegata var. pallida N.E.Br. Stapelia woodfordiana hort. ex Haw. 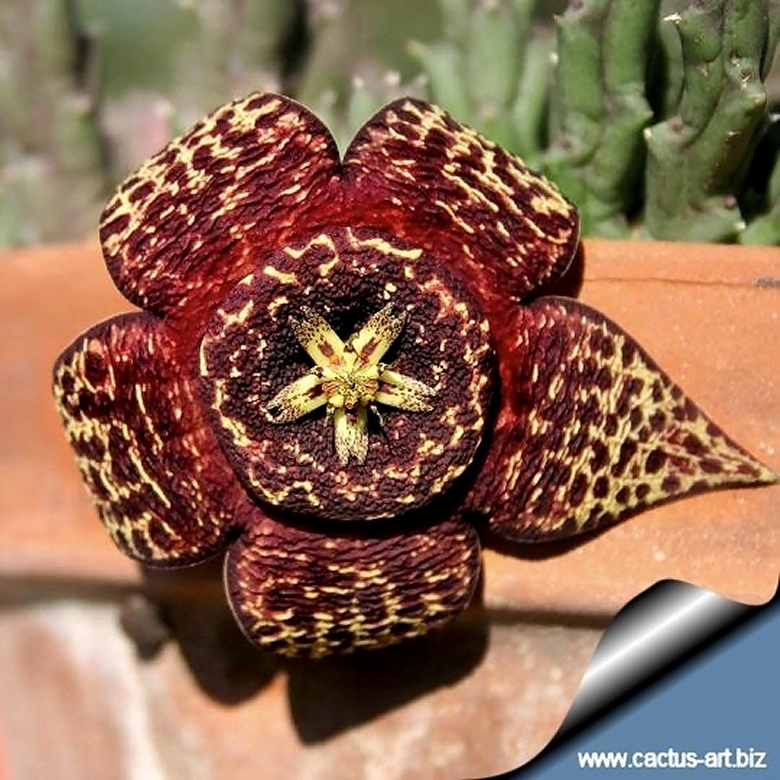 Description: Orbea variegata is a soft stemmed succulent erect or prostrate, branched above ground. In age forms big clumps. 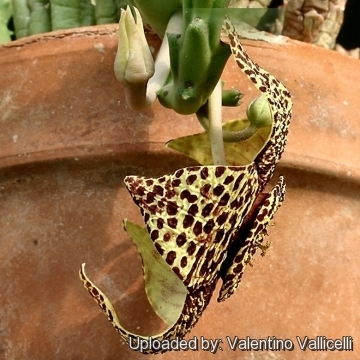 The carrion-like smell of the flowers attracts flies and other insects for pollination. 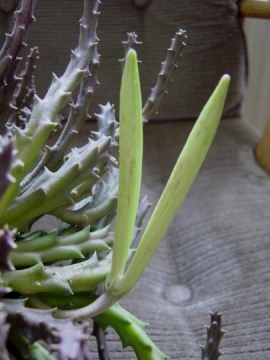 Stems: Sprawling and decumbent over to 25 cm long, toothed, grey green mottled purple in full sun. Flowers:* The typical flower is 5-7 cm across with 5 blunt lobes, starfish-like, attractively patterned or dusted with chocolate/purple, brown/bronze blotches on a greenish-yellow background, mostly in 6-7 rows or irregularly scattered, Corolla rugose, with a yellow central disc (annulus) speckled with dark spots. Blooming season: Flowers coming in late summer or fall, have a light carrion smell. It is quite free flowering if in direct sunlight. Fruits: The plant can readily set seed, after the fecundation the carpels develop long cylindrical fruits up to 12 cm long, these need to be contained when they ripen, because as soon as the fruit opens it liberate a cloud of flying seed provided whit a white feathery cotton fluff. The seeds can float from the pods and drift around the greenhouse on the slightest breeze. 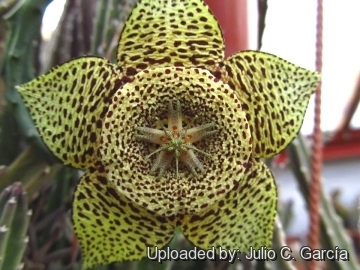 Orbea variegata (L.) Haw. : flowers very much smaller, corolla sulphur-yellow with purple-brown dots with a paler circular bulge (or annulus) around the corona scattered with smaller purple spots. 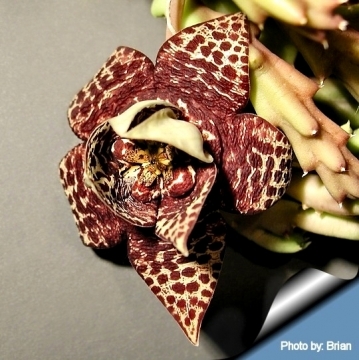 Notes: Orbea variegata is almost certainly the most common Asclepiad in cultivation, even if it is still often seen under its earlier name of Stapelia variegata. (name given by Linnaeus) nowadays it is possible to find plants with both names in collections. And for the reason of the variability of the species, many could believe they have two different genera represented. 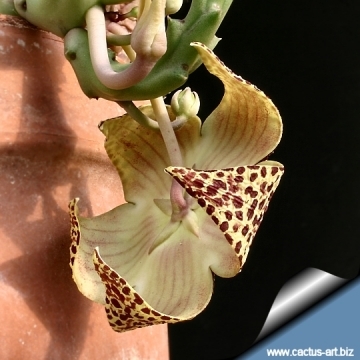 Cultivation and Propagation: Orbea variegata is very easy to grow, it is the ideal plant for beginners. Soil: Use a gritty, well-drained soil pH 7,5 to 8,5 (mildly alkaline). Exposure: It needs Light shade to full sun (but tolerate shadow). Temperature: It is very resistant to heat, and will also tolerate quite cold temperatures and light frost too (in good condition), best in a ventilated environment. Moisture: Water regularly during the growing season, keep dry in winter. Pests and diseases: It is quite resistant to the “Balck spot” disease of Asclepiads. Propagation: It is easily propagated by removing a cutting, sometimes with roots attached, in spring and summer, But seeds germinate readily if they are sown when fresh.